Note: Thanks to Orbit for providing an Advance Reading Copy of this title. Sorry the review took so long to appear! We live in a pretty filthy and creepy-crawly world when you think about it. We’re surrounded by life, it’s everywhere and it’s mostly so small we’ll never see it. Even your own body plays host to more non-you organisms that it does to your good self. Something like two-thirds of the body’s cells are non-human which will either have you gasping in awe and trying to find them if you’re like me or wretching and itching uncontrollably if you’re more normal. Don’t worry though, the hygiene hypothesis tells us that this is kind of okay. Our daily exposure to these alien organisms, both within and without, helps maintain a healthy immune system and keeps a whole host of diseases and allergies at bay. Unfortunately our recent reliance on disinfectants and the like is drastically reducing our exposure, and our resistance is likewise plummeting. Such is the central thesis of Mira Grant’s Parasite. What can we do to reverse the damage our increasingly sterile environments are wreaking on our bodies’ natural balance? Enter SymboGen, a bio-engineering company which has created a concept so radical it will revolutionise the medical industry forever. The Intestinal Bodyguard is a parasite based on the the tapeworm which lives happily in our guts, programmed to secrete any medication we need, as and when we need it. Far-fetched? Of course it is, verging on ludicrous, but suspend disbelief for now and strap in – the ride’s going to get a whole lot crazier. Sally Mitchell is unique. Well, aren’t we all? The thing is though, she used to be dead. Following a serious car crash her brain was so badly damaged that doctors pronounced her beyond hope – until, that is, her SymboGen implant kicked in and began reconstructing brain tissue. Overnight she became a sensation, a miracle and above all a poster girl for the new parasitic technology. There was a problem though, her revival came to late to save her memories, forcing her to re-learn everything, from relationships to language, from scratch. Her recovery continues at pace, monitored closely by SymboGen and their legions of doctors and psychologist, and all is looking rosy. Until… it seems some of those carrying implants aren’t faring so well. Suddenly a rash of incidents occurs, parasite-carriers turning blank-faced and immobile before attacking those close to them. What’s happening? Why is SymboGen preventing the news from hitting media outlets? And why do the affected all seem to know Sally’s name? If this all sounds ridiculous then don’t worry, you’re absolutely right. And, as you should know from reading this blog, ridiculous is often a wonderful springboard for a good story. Does it work for Parasite? Well, yes and no. Let’s deal with the good first. 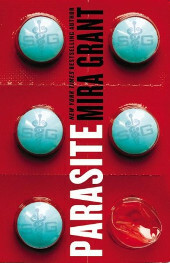 Straight off the bat the parasitic implant idea if bloody wonderful. It’s visceral, creepy and pushes all of David Cronenberg’s favourite buttons. It’s hard to get more disgusted than by an enemy which lurks inside you. Once the story gets moving we’re in good old horror movie territory and it rattles along at a fair old pace. Unfortunately, Parasite could have done with slowing down a little and paying attention to some details. The characterisation in particular could have used some work. Sally, the novel’s heroine and central character, is at times painfully weak and pathetic. Rather than eliciting a sympathetic response I found myself groaning at yet another ‘screaming and running away’ situation. Okay, she’s technically six years old and dealing with an insane problem but still, some backbone would have gone a long way. To be fair perhaps this will develop in the forthcoming two installments in the planned Parasitology trilogy. Further, the two ‘bad guys’ in the book seeming to represent the evils of science and business are truly ridiculous caricatures. One would do anything for money, the other for knowledge, neither appearing remotely human and thus losing a lot of plausibility.